Does your child snore? Does he or she have trouble staying awake during the day? Has his or her school performance or behavior declined in recent months? Have you been told it seems like he or she has ADHD? If any of this describes your child, then it could be obstructive sleep apnea (OSA), a sleep disorder that is on the rise in children. At Pediatric ENT Associates in Birmingham, we know how much child sleep breathing disorders can disrupt your life. But why are cases increasing? How can you tell the difference between sleep apnea and simple snoring, which is much less harmful? What signs should you look for? Childhood snoring can be a serious health issue, typically characterized by a blockage (complete or partial) in your child’s upper airways that cause your child to stop breathing for a short period of time. This can happen dozens of times a night, which can increase the risks of damage to the brain. The physical cause for child sleep apnea is the over-relaxation of muscles in the back of the throat, causing the airway to collapse and, thus, your child’s breathing issues. The most common factor in many children’s obstructive sleep breathing is enlarged tonsils or adenoids. There is still ongoing research into whether or not there is a link between the increased rates of childhood obesity and the increases in childhood snoring cases. If you suspect that your child has children’s obstructive sleep breathing, here are some things to look for while your child sleeps. If you notice any of the above, contact Pediatric ENT Associates. While the above are signs of disrupted sleep, some could indicate another issue; for example, excessive or loud snoring could simply be due to nasal congestion or a respiratory infection. Only a specialist in children’s ENT issues can tell for sure. There are several effective snoring solutions that can help your child overcome his or her sleep issues. Talk with your pediatric ENT specialist to help determine which one could work best for your child. 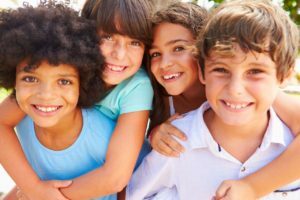 Because enlarged tonsils or enlarged adenoids are a common cause of childhood OSA, surgery to remove either or both sets can help solve this issue. In cases where sleep apnea is particularly severe, surgery may not work (even if the snoring has ceased), in which case further sleep study is necessary to know for sure whether or not your child has been cured by this surgical sleep apnea treatment. Learn about the tonsillectomy procedure at WebMD.com. If your child has a structural irregularity in his or her throat, face, mouth, or jaw, then a different type of surgery may be in order. Consult with a pediatric ENT specialist to learn more. If enlarged adenoids or enlarged tonsils are not to blame, then a less invasive sleep apnea treatment is on tap – CPAP therapy – a , a common treatment that’s gentle as well as effective. In CPAP treatment therapy, your child wears a mask that covers his or her nose and mouth during sleep. The mask is hooked up to a machine that gently pumps a steady flow of air into the mask, producing mild pressure your child’s breathing passages open during sleep. The effects can be amazing. Many children report a noticeable improvement in their sleep and overall condition after just a few nights of CPAP therapy. If your child is overweight, this could be the cause of his or her sleep apnea. If so, a weight loss program should be designed. You might have to help change your child’s eating and exercise habits so that he or she will lose weight. In fact, even if you decide to employ other types of sleep apnea treatment, weight loss should be among your top goals in improving the quality of your child’s life. Talk to your doctor and, together, come up with a plan to reduce your child’s weight and engage in other safe, effective, and easy weight-loss methods. If your daughter or son is showing signs of suffering from sleep apnea, don’t hesitate to contact Pediatric ENT Associates at the Children’s Hospital of Alabama in Birmingham ASAP. If she or he does indeed have childhood sleep apnea, don’t ignore it. Our board-certified, compassionate pediatricians are committed to your child’s well-being, so contact us online or call us at (205) 831-0101 today.